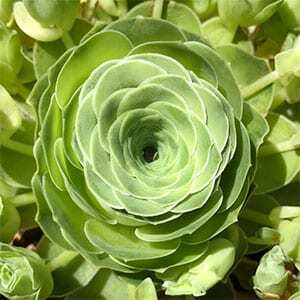 An attractive clumping succulent with green rose shaped flowers Aeonium aureum is commonly called Green Rose Buds. This is a fascinating plant that puts on its best show in winter when the heads of foliage open out to form a green rose like rosette. This succulent from the Canary Islands and are naturally summer dormant, you can keep them looking a lot better by giving them some shade through the hot summer months. A little are water in the winter to spring period of active growth. Use a well drained cactus and succulent potting mix. Plant at the same level as the plant was in the container. Water in well immediately after planting. A light mulch of small pebbles can be placed over the soil surface. Water only when the growing medium begins to dry. Repot into new potting mix every 3 years, removing as much as possible of the old mix. Common Name – Green Rose Buds. Position – Part sun with a little afternoon shade in summer. Spread – To around -4 metres. Frost tolerance – Medium to light frosts only.